Anel Hotel in Sofia, Bulgaria. 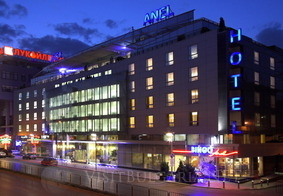 Book Hotel Anel in Sofia city. Location: ANEL Hotel is the newest five - star hotel of ultimate hospitality for guests with high expectations. In close vicinity are the impressive Alexander Nevski Cathedral and the Russian Church. The ANEL Hotel is also close to major banks and governmental offices. Banqueting Facilities: The sense of luxury and the original suggestions of high cuisine turn every reception into an event that will be discussed. Special choices of menus, buffet or gala dinners are as impressive of their taste as of their presentation as well. Conference Facilities ANEL Hotel allocates fully equipped conference hall. Dining: The chef invites you to a delightful trip in the world of taste, of both Bulgarian and international cuisine, for a true feast of unique specialties impeccably served. The lobby bar is a distinguished for the fine decoration, the warm atmosphere and the service. A cozy place where friendly or professional meetings can be held and where guests can have an aromatic coffee or an exotic cocktail. SPA Centre: This is the perfect place to start your busy day or to rest after a long day.